Last Sunday, it was a lazy day. I was suppose to go out today to purchase an external Hard Drive and to look for bustier sets but laziness struck me once again so my plans of shopping for the day didn't pushed through. Anyway, I just stayed at my shop to do some scrapping and I am actually making my 6th photobook. This will be a simple one since it has multi pictures. The 4th PB (18thbday of my niece) is arriving from Artscow hopefully at the end of the month. I'll be ordering the 5th PB (mom's 75th bday) by next week or so. I've been scrapping continuously ever since I got my 1st PB from Artscow. It's very inspiring to see your works printed already. im have such interest in scrapbooking buat i never try the digital one..
im so get used to cut n paste embellishments and buy all fancy bits and button from shop. 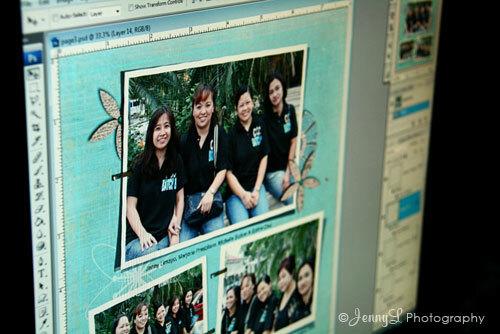 nwys, how to get start using digital scrapbook? is there any specific software you use? anyway, you can use PSP (corel paintshop pro), or Adobe photoshop to layout your scrapbook.. there are many tutroials online if you want to get started..